Nassim Soleimanpour. Photo Credit: David Monteith-Hodge. 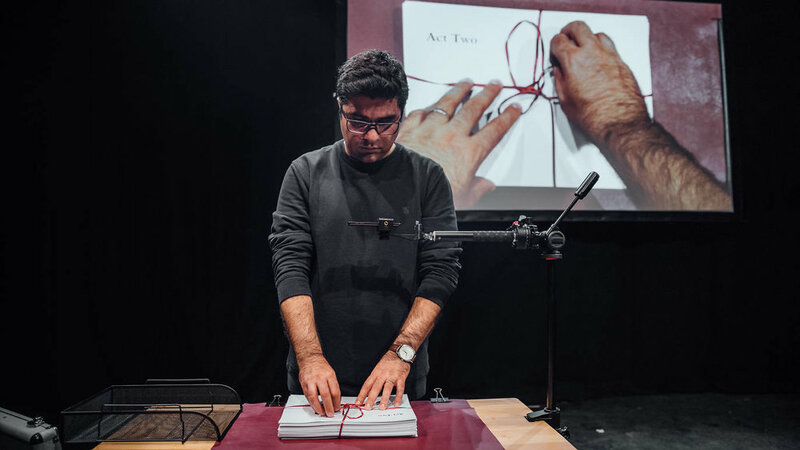 Iranian playwright and performer Nassim Soleimanpour made a splash in New York back in 2016 with his play “White Rabbit Red Rabbit”, every performance of which featured a different well-known actor performing from a script he or she was reading cold for the first time before the audience. That might sound like a gimmick—well, in fairness, it is—but it served a clever allegorical purpose. Mr. Soleimanpour wrote the play, his first, before he could perform it outside of his native Iran. By the time he was permitted to travel internationally in 2013, “White Rabbit Red Rabbit”—a baldly political piece bathed in metaphor—had already been performed in 30 languages in 50 countries. The setup of “Nassim”, his fourth and latest play, is just as mysteriously irresistible—and familiar. No rehearsals, a different guest actor at each performance, and a sealed envelope waiting to bring a story to life. This time, however, Mr. Soleimanpour is on hand to participate, but that, of course, did not come easily. If you have paid attention these past two years, you know that the Trump Administration imposed a ban on travel to the United States by people from several Muslim-majority countries, including Iran. Like several of the performers in “The Jungle” at St. Ann’s Warehouse, Mr. Soleimanpour had to fight this travel ban in order to come perform his show, presented at City Center Stage II by Barrow Street Theatricals. At the performance I attended, Maria Dizzia (“Orange is the New Black”, “If I Forget”) played the role of “actor”—opening that sealed envelope, following its instructions, and beginning a journey with the audience at her side to uncover, together, what “Nassim” is about. Stop here if you plan to see it (and you should). If you’re still reading, Mr. Soleimanpour’s play is about language, connection, friendship, and storytelling. Its very operation means to break down barriers between people of different backgrounds and languages to create—for a time however fleeting—a common language and a common bond. Ms. Dizzia’s lines are fed to her by their projection on a screen, the image changed by hands of the unseen author shuffling cue cards until he invites her backstage to join him for some tea, and she convinces him (per the script) to reveal himself by joining her back onstage to the applause of the audience. At this point, dubbed “act two”, Mr. Soleimanpour engages in a language lesson, teaching the guest actor and then a handful of audience members, selected words and phrases in Farsi—all without speaking a single word himself—that collectively form a story, beginning, as all good stories do, with “once upon a time”. This fairytale of sorts recalls Mr. Soleimanpour’s own childhood, his house, its balcony, and his mother. He produces a picture book of the story—the supposed play he wants his guest to perform—and then uses his cell phone to call up his mother in Iran so that the guest actor can read the story to her and the audience, with our newfound, common tongue. Directed by Omar Elerian, “Nassim” is a sweet, slowly enveloping, admittedly manipulative experience that speaks to our shared humanity and breaks down the perceived barriers we erect between people, groups, and nations. In order for the effect to work in just 75 minutes, the content is itself simple and perhaps limited, but the message is superior and unmistakable. It is a cruel irony that Mr. Soleimanpour, who hails from a repressive country, had to break down so many barriers just to perform his own play in our supposedly free country. “Nassim” gently teaches, inviting empathy and communion between the guest actor and Mr. Soleimanpour, and the audience. I suppose the ultimate guest actor would be Donald Trump himself, assuming he is capable of empathy or learning, but no matter who your guest actor is, “Nassim”, and the lessons it teaches, proves its necessity by its very existence. Bottom Line: Iranian playwright and performer Nassim Soleimanpour’s latest play features a different guest actor at each performance, reading cold from a script fed by the author. This mysterious but sweet, slowly enveloping experience speaks to our shared humanity and breaks down the perceived barriers we erect between people, groups, and nations. Check it out.